Whenever I come to Kasese, I enjoy and sleep like a young child. Thank you for giving me a second home. Thank u for the support you have given me as a person and the party in general. I also want to thank you for giving leadership to the struggle. Joining FDC is joining the struggle. And joining the struggle is a sacrifice in itself. Not for you as a person alone but also your family. They are denied scholarships, tenders, NAADS because they are related to you. Some families have broken up because of this struggle. In fact NRM uses it convince your family that they would get govt services if you were not in FDC. I know of an old man in Rukungiri who has sons in police. These sons attacked him that they have failed to get promotions because he is an FDC leader. I want to tell you what NRM is. If you are competing with your opponent in a football match, you must study your opponents and their tactics. Fortunately I am one of those who built NRM. I know what it is. NRM is not a political party as FDC. It started as an Armed Organisation. It had the political wing and the military wing. Power in the country was captured by the NRA the military wing which handed it over power to Political Wing NRM. Read Legal Notice Number One of 1986. NRM turned into the state. NRC became the parliament of Uganda. At the time it had 38 members where I was of it’s members. The Chairman of NRC Museveni became the speaker of Parliament and at the same time the President. Because he was busy, it was the Vice Chairman Haji Kigongo who would act as Speaker of parliament. Some times it would sit as parliament and at other times it would sit as NRM organ. From 1986-2006. It’s other structures became state structures eg the RC (1-5) which became LC. We had District Administrators of NRM SDA. When we took over power they became DIstrict Administrators. In 1995 the name changed to RDCs. The NRM secretariat became a national organ. The NRM school of political science became National Leadership Institute. The NRM intelligence organs the External and Internal became ISO, ESO and Military Intelligence. They all became state organs. There were organs the NRM didn’t have in the bush like the police. All these years they have made sure they turn them into NRM organs. Like unce Museveni said Kayihura is a great NRM cadre. By nature M7 fears elections. When I came out in 2001, he panicked. NRM is a political system according to the constitution. So whoever wants to contest, comes as an individual. When I came out, he said it can’t be. He called the NRM organ and declare him the NRM candidate. This exposed NRM as a party and not a system as they wanted the world to think. We started parties but the Movement state was not dismantled. Actually like the LCI has never been competed for. The challenge we have is that we are competing against the NRM State. For 20yrs there was no formal opposition against the NRM. That is why corruption became the centre stage. Hence public services like education, health, infrastructure etc callapsed. Because of this, NRM became unpopular. There was betrayal of Ugandans. We disagreed with Museveni in 1989 when I told him that we should do what we set out to do. In 1990 he fired me from his govt and sent me back to the army. In 1999, I wrote a document outlining what was not going well in the movement. He refused to discussion my paper up to today. We are struggling against the NRM State. We have a disgruntled population that wants this state out. That support has been huge all over the country. 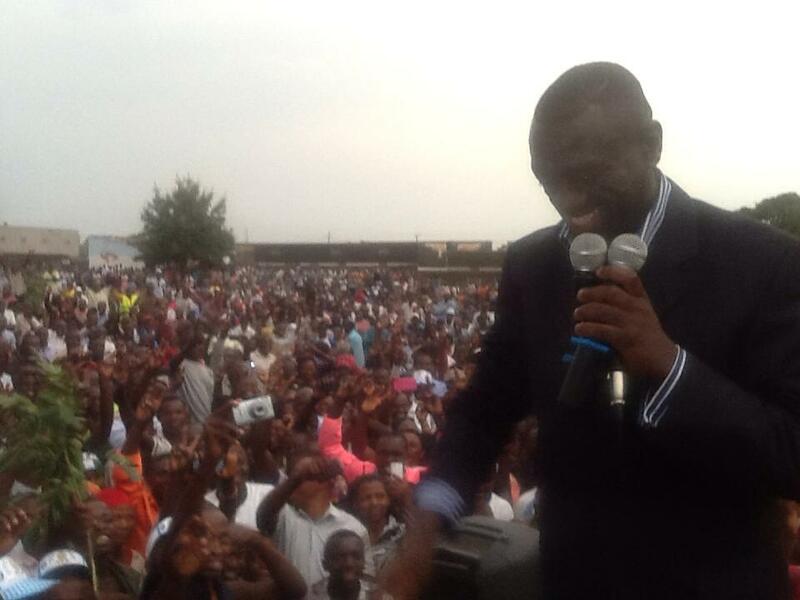 This support has failed to achieve our goal because the NRM State manipulates elections. In 2011, Museveni picked 2 Trillion without the approval of Parliament. After the elections inflation went above 30%. Fuel prices went to near 10,000/= and sugar the same price. They have been able to rig because the NRM controls all the state institution. The Supreme Court Judges agreed that the elections were not free and fair except that these judges didn’t know how to use these facts. So our support is not questioned. Gen. Sejusa confirmed this when he said that we actually won by 69% in 2006. This statement has never been challenged by NRM. Since 2009, Our task has been structural reforms. Parliament said they didn’t have time. That It was too late. We didn’t go to court in 2011 coz we realized that the problems we have are political and not legal. In 2014, Ugandans met at African Hotel and came up with the Citizen Compact which was signed by Political Parties, CSO and individuals. We all resolved that we should not go to the next election without reforms. Museveni is actually the Speaker of Parliament because when there is a serious matter, he calls the NRM Caucus which he chairs and what he wants he what is actually that is approved by Parliament. Last week, these reforms were rejected by Parliament unfortunately including some of our people. We don’t know if they don’t know what we want or they are working with the dictator! Our people fear to deal with the tough situation and do the tough work. In 2001 I told my colleagues that Museveni was not going if we don’t chase him, they thought he was only seeking his last term. At the end of the day, he changed the constitution and he is still around. When he was changing the term limits, if we had tough people, he wouldn’t have it. MPs ate 5M and changed the constitution. This time around MPs were given 110M which even some of our MPs took. The Electoral Reforms were thrown out. I came to this Election for TWO reason. To galvanize our support. Actually many of our people were especially in the East and the North, had started looking at JPAM. I believe I can help galvanize this support. I still think we should put up a fight for Electoral Reforms. Happily we have support from the International Community. You recently heard the EU asking govt to give genuine reform. The same was echoed by President Obama in Adisa baba. Some of our leaders are fronting the NRM argument that there is no time for reforms. The Time table is not influenced by the law but by the politics. In 1985 there was supposed to be an election but the politics changed. My task is to boost our support, fight for reforms and prepare for election. We are NOT for a BOYCOTT . If you give me the flag, I will go and ask the Captain for Yellow to drop the whistle. Our colleagues are saying they can go to the election as they are without reforms. If so, what forces the dictator to give you reform. It’s like taking your neck to the slaughter house. This has been the Struggle I stand for. This struggle is about the 84% unemployed youth. This struggle is about the 19 dying mothers daily. This struggle is about the kids dying before their birth day. This struggle is about the poverty of our people. This election is a matter of life and death. The NRM is at it’s weakest. It has attacks from JPAM, Prof. Bukenya, Gen. Sejusa. By the time we meet them, they will be at their weakest hence easy to defeat. My colleagues are talking about building structures. I cut my first term as party president short in order to build structures except that in a dictatorship, you can’t have strong structures, he keep buying them. Since 2006, FDC has been the Leaders of Opposition in Parliament. How would that be possible if we didn’t have structures? Those structures we built with our own efforts. But this time around, the party got 1.1 billions. But structures should not be the main issue for this particular election. Our Team decided that when they pour mad on us, we get water and clean. Moses took the Children of Israel from Egypt and crossed the Red Sea to where Joshua found them. In our case, we are still in Egypt and the Pharaoh is still Alive. So Joshua should wait for Moses to cross the Children of Israel from Egypt. I once again ask you to support me and elect me as your flag bearer.